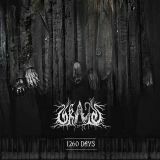 It’s a bit interesting to review 1260 Days by Skald in Veum because it’s putting me back to where I began writing for Metal Reviews almost three years ago. Somewhere hidden in the early 90s, amidst the original black metal bands such as Mayhem, a different kind of black metal, or should I correctly say unblack metal, began to emerge (most notably with bands like Antestor). Of course when I mean unblack metal, I am simply stating that these bands are not basing their themes on the occult or Satanism, but rather flipping the whole anti-religion aspect of black metal on its head to bring about, dare I even speak it on a metal site, Christian themes. With that aside, I have to be honest. I had not looked up this band other than listening to the promo I was given, and I would have never guessed these guys take on the flipside of religion when it comes to dark sounding metal. Ravens Over Lübenholz is a short intro to the EP, containing a raven in the distance with an approaching storm. And the storm certainly delivers, unleashing with Drunk With Tainted Blood that can really tear through flesh with a violent sound. Inferno is another visceral track, pounding with solid sounding blast beats, but also delivers a slower, darker, and even more menacing sound to revel in. Eden Raped keeps up with the vicious tone, but also has that fierce, northern winter feeling to it. I know this will come as an offense to those who love black metal (but to be clear once again, this is an unblack metal band), and I wouldn’t be the least shocked because tying this style music with the themes chosen is an oxymoron. Nothing about how the band sounded to me before doing some research felt Christian, but their lyrics certainly scream it. Surprisingly, Skald in Veum, despite having themes that will more than likely upset the hardened black metal fans (because who isn’t offended by everything these days? ), it is a solid EP from a band I’d least expect. I am in no way a religious person in any aspect, nor do I believe any of the non-sense found in any sort of holy text, but that did not deter me from enjoying 1260 Days.